Three days ago, I was weaving in ends for hours, when Mo jumped on my shoulder, out of nowhere and unexpected as usual. "Uh, tidying away ends, isn't that tedious?" she whispered and gave my earlobe a pinch. "Tedious, why? No! It's like meditation to me" I lied in my sweetest voice and went on sewing. "I see!" she answered briefly and was gone the next moment. The next day, I was still busy with my large eyed yarn needle, Mo poked me in the back: "Hey Jo, still in deep contemplation?" she shouted. "Come one, let's take a break. Live is short, there is so much more we could do!" "Thank you, but I can't. I have to finish this first!" I answered and tried to look energetic whilst feeling quite worn out. "So, you're not interested in me helping you with your little novel?" I stopped amazed "You really want to help me with that?" "Just kidding! You know, novels are not my business" she laughed. "Then you better leave me alone" I mumbled and off the so-called muse went. Yesterday night, the very moment I had tidied away the last yarn end, she reappeared. "Yay, Mo! I did it!" I said pointing on the hexagon covered chair. Mo wagged her head "If you asked me, something is missing. 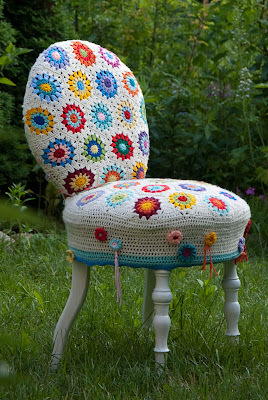 It is such a cute old chair, we should pay a little more attention. Maybe some flowers?" "OK, then flowers" I sighed and reached for my crochet hooks. Today I sewed on the flowers and was very pleased with myself, because I had finished that project. "What do you think?" I asked Mo. "Sweet!" she answered. "It reminds me of a wedding cake in disguise. Fortunately Safran the cat isn't as critic as Mo. He said, it would be just perfect for him. A bed, a scratcher and, with all the tassels, a wonderful drill ground. What a cutie! A happy, sunny weekend to all of you! P.s. : The hexagon pattern is by the wonderful Attic24. Ingenious! What a fabulous way to cover a chair! I didn't see the blog link before I went on and on on Flickr!!! But I still think it is a wonderful thing you have made here. So creative and unique.....until all the others see it and make their own!!! But YOU were the FIRST one....so it's YOURS!!! OMG, I stumbled onto this photograph on Flickr and had to FAV it immediately. Then I came over here to your blog and read this post. What a wonderful idea. Stunning! And Safran looks rather royal sitting on it. Such a beautiful job you did. So worth weaving in all those ends! It is charming and an eye catcher! For all of us! So beautiful. 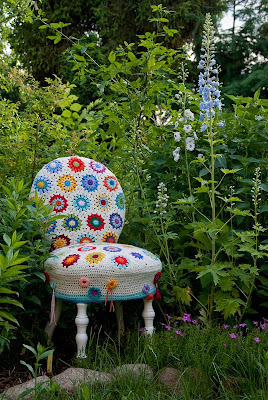 I love the little flowers on the chair seat. It makes me think of Alice in Wonderland. I found your blog through Sarah London. This is Gorgeous! Fabulous!!! Definitely looks like something Attic24 aka Lucy would do! I saw this on Ravelry and was so impressed. It's breathtaking! Congrats on your finish! That is amazing! Truly fabulous! Hi! I found your blog on Flickr. This chair is gorgeous!! If you like: I have a blog post right now in which you can add a picture and a link to your blog or Flickr-album. I'd be delighted if you add something! Hi Ich liebe diesen gehäkelten Stuhl. Thank you so much for posting on my blog! I hope to see you again there soon. Feel free to add a picture again next Saturday! Oh - oh - oh.... my! Thank you! Thank you! Thaaaank youuuu! Mo and me simply can't belief it! So many nice comments! We've read every single one to the old lady-chair and she is proud as a peacock, now! By the way, we decided to name it Lucy in honour of Attic24. This chair is so very beautiful!!!! I find it absolutely amazing! You've made a great job and the idea is fantastic. Love the colour. Unfortunately I'm not sure I would be able to do a cover like this. Bye, Clara. What a very nice chair! I love it :-) Greetings! so unbelievably beautiful!!! i'm speechless.. I LOVE this chair! Its absolutely beautiful. I love the mix of colors together and YES! It totally looks like a fabulous wedding cake. Beautiful work and so creative! Great idea, super work! Beautiful colours! I think this is one of my most favorite crochet projects ever!! I adore it! I love this. You're so creative! It's very beautiful, wunderfull all the colours! I LOVE it! This is so fantastic I had to blog about it! Thank you for sharing! 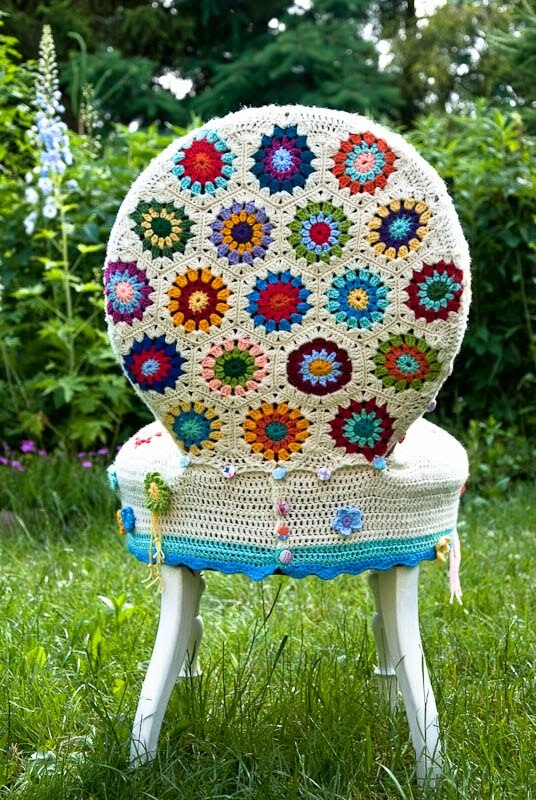 That crocheted chair is so clever! I just love it! Lucy has some great stuff over there at Attic24, doesn't she? 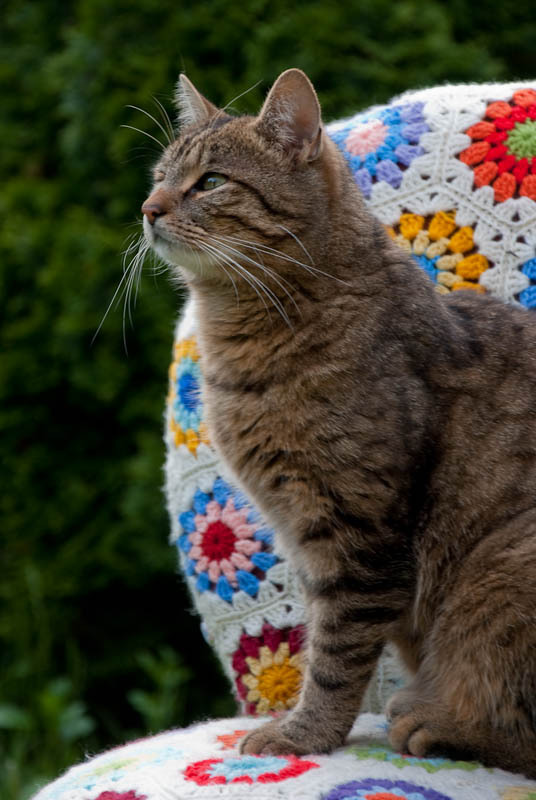 Your kitty seems to like the coziness of the chair too...the best of sitting up high and curling up in an afghan, all in one! Found you from Nedra's site, now off to check out what other fun stuff you have here. I love it ! es ist wunderbar ! This is so beautiful, stylish and original! Oh this is gorgeous. I have a chair I really need to re-do but never thought of this. I love how unexpected and delightful this whimsical chair is. Oh how I wish to sit on it and touch it and play with the tassels...I'm actually jealous of your cat. How creative you are. I am so happy to have found your blog today. I would love to have this chair in my home. Absolutely beautiful! Your cat looks very happy. What a lovely chair! A great idea to bring an old item to new life. I am looking around now for such a chair to try this same idea. Freaking gorgeous! Found this via Pinterest and it is stunning! Extremely beautiful, oh I want the same it's absolutely gorgeous !!! Stunning - really need to put this on my long term making list! I love the chair and your storytelling :) thanks!